OEM equipment is mostly well designed and fabricated to a good standard, having originally been supplied to an EPC contractor. However, when the flare approaches the end of its serviceable life it is generally only the upper regions of the flare that have failed. The mid and lower regions could often provide a further 10 to 20 years of continued service. Most OEM’s offer a straight like-for-like replacement that provides a similar life expectancy for the same operating envelope. However, with today’s trend of reducing purge rates as well as changes to plant capacity, this can often lead to a lower life expectancy due to higher instances of internal burning and/or external flame-lick. Here at Argo Flares we take your used flare and remanufacture it to an “As-New” condition (complete with mechanical warranty) that will at least match the life expectancy of the original flare. 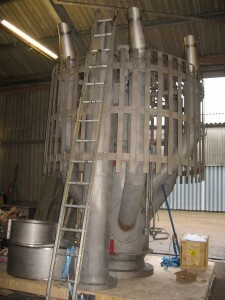 Please visit our flare refurbishment page for more information. During stage one of the refurbishment process, following the workshop inspection of the flare, Argo will typically recommend various flare upgrade options. These flare tip upgrades are in the form of both detail changes and material enhancements, and are intended to increase the flare’s serviceable life expectancy by a noticeable amount. Visit our flare upgrades page for more information. Regardless of whether it is a flare refurbishment, flare upgrade, or a new replacement flare, we strongly recommend checking the current process operating conditions, along with any future requirements, against available historical design data. This enables a hydraulic design check of the flare tip to be undertaken and also provides a further opportunity to consider possible process design enhancements. Argo Flares works closely with organisations that actually carry out the flare tip changeout activity. We can even have an engineer on-site during the change-out. Argo also works closely with dedicated pilot and ignition system supply companies. We can review, recommend and supply all your flare service requirements at a one-stop-shop. We also have a fast track supply service for those unexpected urgent flare material requirements that you may have. …it makes it makes sense to refurbish your flare.